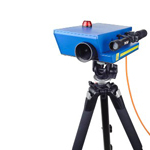 Detect a 0.2 inch (5 mm) movement at a distance of 100 feet (30 m). 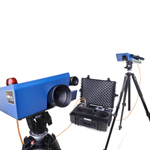 A telescope mounted on the projector allows the LEADER Sentry to precisely focus on the targeted building or unstable structure. LEADER Sentry continuously detects and warns of any movement. Various maximum movement thresholds (stepped from 0.2” to 4” (5mm -100mm) can be selected. When any movement monitored exceeds the selected threshold, the audible alarm is activated. Powered by 8 x lithium AA batteries which allow 14 hours run time. 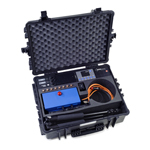 The Sentry can be powered by an external 12V source for continuous run. Various alarm sounds to differentiate between alarm, fault, etc. 2 beams (optional) can operate simultaneously on one single monitor to watch simultaneously 2 sides of a collapsed building or two different building !